It’s astonishing the money and time many elite and “weekend-warrior” cyclists devote to retrofitting racing bikes to conform to their bodies rather than first restoring function to the most critical piece of racing equipment: the rider’s body. It makes sense to first get the kinks out before sending the client off for an expensive and sometimes useless bike retrofit. Without hands-on maintenance and functional fine-tuning, cyclists often unknowingly reinforce dysfunctional movement patterns ingrained from long-forgotten micro- or macro-traumatic injuries. Confusion and controversy over this chicken-or-egg (bike-or-body) thing is primarily due to lack of understanding of the Law of Cause and Effect. For instance, let’s say a bike shop performs a retrofit and Bob, the cyclist, smilingly pedals away on his newly reconstructed machine feeling secure and pain-free. Life is good… or is it? To make matters worse, stubborn pain-spasm-pain cycles often appear as the hip stiffens and the imposed stress destabilizes sacroiliac and low back structures. In the presence of lumbar spine instability, the brain may decide to lock down the low back and Figure 4 ribcage with protective muscle guarding. Thoracic cage rigidity not only inhibits proper diaphragmatic breathing but also sends shock waves through the thoracolumbar and pectoral fascia and into the upper extremity joints where reverberations are met with strong resistance from habitually locked hands, elbows and arms. (Fig. 4) Meantime, compensations from adhesive hip capsules also traverse down through Bob’s knees, ankles and feet searching for a weak link in the lower kinetic chain. Cyclists who opt for a bike retrofit prior to receiving manual therapy to release fibrotic hip capsules and hip flexors, soon notice a loss of endurance and may develop soft tissue or joint sprains associated with lumbopelvic imbalance. Oddly, many flexion-addicted cyclists attempt to work through the injury despite sensing a noticeable reduction of speed, power and efficiency. “No pain, no gain” is an unacceptable working model for those seeking longevity in the cycling sport. Cyclists who consistently ride with an anteriorly rotated pelvis and decreased hip angle are subject to capsular and ligamentous adhesions and a subsequent loss of economy and power. To accommodate the loss of hip extension, many recreational and competitive racers compensate by posteriorly tilting their pelvic bowl and rounding their backs into a hyperkyphotic posture just to increase hip angle and power. 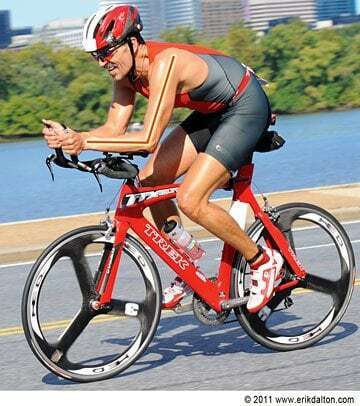 The famed cyclist Andy Pruitt believes that changing the seat height by a mere inch alters mechanics and motor control patterns of every joint in the lower extremity. 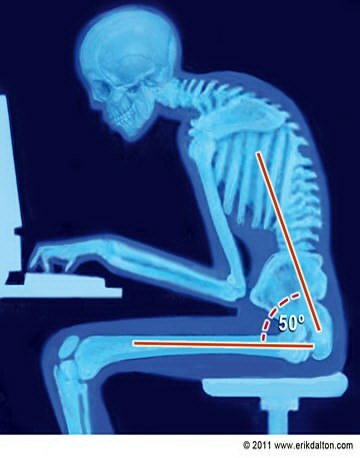 By decreasing seat height, excessive force is transferred to the patellofemoral joint, while raising the saddle too much strains the hamstrings, low back and hands. Stand and try this: Lift one leg with the knee bent about 90 degrees as high as possible without straining or rounding the back and forcing hip flexion. Most people are able to comfortably hip-flex about 90 degrees. Try this maneuver again except this time forward-bend your trunk about 50 – 60 degrees, while raising the knee. Notice a dramatic reduction in the amount of hip flexion? Try both tests again and this time, measure available hip flexion by observing how high your foot raises off the ground. This test illustrates what can happen to hip-impaired cyclists: decreased hip flexion = greater effort = more work = poor performance. The first order of business when treating adhesive (motion-restricted) hip flexors and capsules is to mobilize the hip in all three cardinal planes. (Fig. 6a) To restore myofascial balance, fast-paced “spindle-stim” maneuvers such as those shown in Fig. 6b help tonify weakened (neurologically inhibited) gluteal and hamstring muscles. 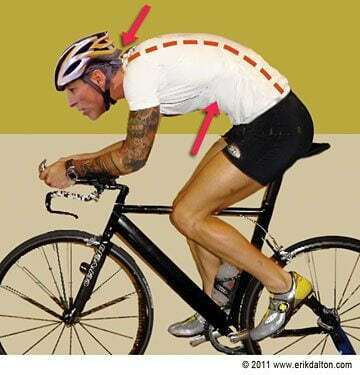 Once the therapist manages to increase hip angle and establish proper functional balance and range of motion, the cyclist is free to decide which type of riding posture (he believes) suits him best. Excessive posterior pelvic rotation and exaggerated thoracic kyphosis. Although this is a very popular riding position, it places undue stress on the neck, low back ligaments and joint capsules and inhibits proper diaphragmatic action. To perform well in such a challenging event, cyclists like Bob would greatly benefit from a well-constructed manual and movement therapy program that focuses on restoration and maintenance of proper intrinsic/extrinsic muscle balance and diaphragmatic breathing patterns. Fluid and dynamic body movement during cycling events is dependent on the ability of muscles and fascia to stay strong, yet flexible. A healthy lumbar spine is the driving engine in most athletic endeavors and length/strength balance between muscles, ligaments, joint capsules, and thoracolumbar fascia is essential for providing that stable platform. Any weakness or motor control issues are magnified by traumatic shocks from funky road conditions or recurring bike injuries. Eventually, excessive neurological input cannot be handled at the spinal cord level and the information is “fast-tracked” to the brain for interpretation via pain-signaling nociceptors. If the brain decides to “splint” the vulnerable area to prevent further insult, pain-spasm-pain cycles may ensue. Ingrained muscle and motor imbalance patterns such as those discussed by Vladimir Janda, Gray Cook, Craig Liebenson and others, often require a concerted team effort to reestablish normal movement behavior. In most cases, the ideal treatment protocol is to first restore lost mobility to impaired structures and then address stability issues via functional movement training. Like many of America’s other popular, but abnormal, athletic endeavors such as golf, tennis, bowling, etc., cyclists bring with them a complex biomechanical downside that’s often hard to completely fix. The “arched back” model is generally the most problematic. In an attempt to level the eyes, the rider must hyperextend occiput on atlas. The cervicothoracic junction is also forced to hyperextend (neck-on-shoulders) causing chronically locked intervertebral joints and rib jamming. This area is particularly affected by road vibrations due to the stationary position of arms, shoulders and hands. Additionally, ligamentous laxity may develop from excessive thoracolumbar and lumbosacral bowing which, in time, sets the stage for low back pain and disability. 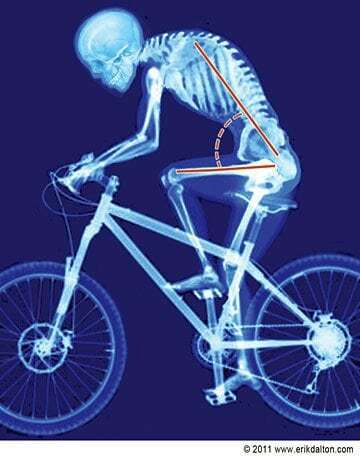 The good news is that the human body is both adaptable and dynamic; the bad news is that our biker clients often bring along a lot of baggage including flexion-addicted sitting postures, old injuries, compensations, poor training habits, etc. 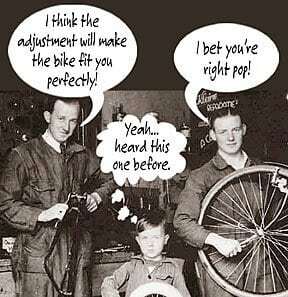 Once the skilled manual and movement therapist makes necessary corrections, the bike can then be retrofitted to conform to the rider’s optimally functioning body. A properly fitted bike combined with a revitalized and functionally balanced neuromuscular system allows muscles and joints to work at optimal levels of motor unit recruitment and synchronization. As endurance and performance improve, so does the natural love of cycling.